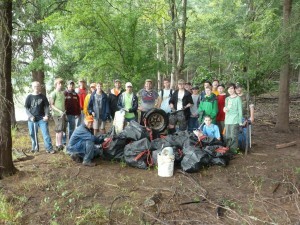 The Occoneechee Lodge 104 of the Order of the Arrow, Boy Scouts of America's Honor Society chose August 17th as a its day of service in the central region of North Carolina . This year, the theme was water conservation and so trash cleanups were set up for three different groups on the shoreline of Jordan Lake. the Neuse River and the Cape Fear River. On a drizzly day, 14 energetic boys led by 7 equally energetic adults arrived at Wilderness Island. 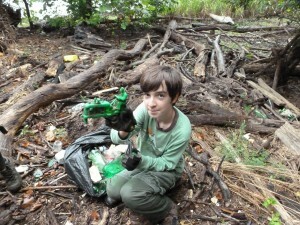 The Boy Scout's motto of "be prepared" was in evidence as they all came in rain gear for the hard work of trash pickup. A 20-minute hike along a logging road brought the group to a section of shoreline that had been cleaned in April by the NC Geocachers Org. 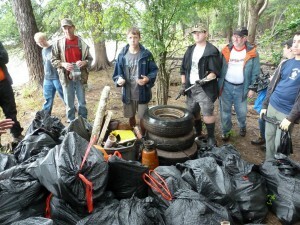 But the heavy rains of June and July brought lots of "fresh trash" down the Haw River to end up here once again. The boys were amazed by what they found. Among the more dangerous items was a insecticide sprayer (see orange object in group photo). Among the weirdest were a heavy plastic bowling ball, a tiny snake in a jar of formaldehyde, a rubber dinosaur, a piglet top to a baby bottle and a green toy tractor. Of course, there were also the usual finds of basketballs, softballs, lubricant containers, chewing tobacco tins and cigarette lighters. The group worked until almost noon. The result was a stack of 50 bags and 5 tires in addition to pails and tire rims.